Can Max still deliver the Payne after a long break? 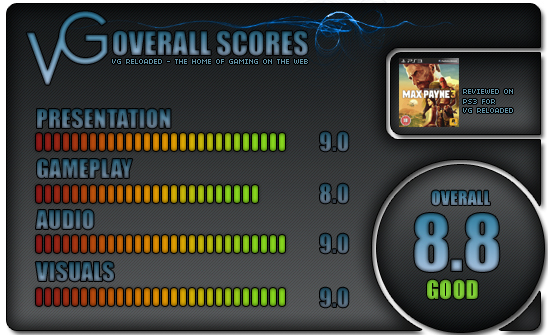 The Max Payne series has been one of mixed fortunes. The first game was a superb hit, one that had a memorable story and gameplay that reinvented the third-person shooter, while the second was more of the same and the less said about the film, the better. But after the 2nd game, Remedy parted ways to work on the Alan Wake franchise, so it was upto Rockstar to tackle a third instalment. But after such a long time away, does Max still have the same effect as he had back in the day? The story takes place in Sao Paolo in Brazil, where Max works in private security. Everything seems to be ok, well except for him still wallowing in self pity with a combo of booze and pills every night. It’s not long before the boss’ wife is kidnapped and Max must work to rescue her, but of course things aren’t all as they seem. You’ll come across a flashback level which explains how Max got to Sao Paolo from the end of the last game, which is a nice touch. Overall, it’s a decent story that is compelling enough to get you through to the end. 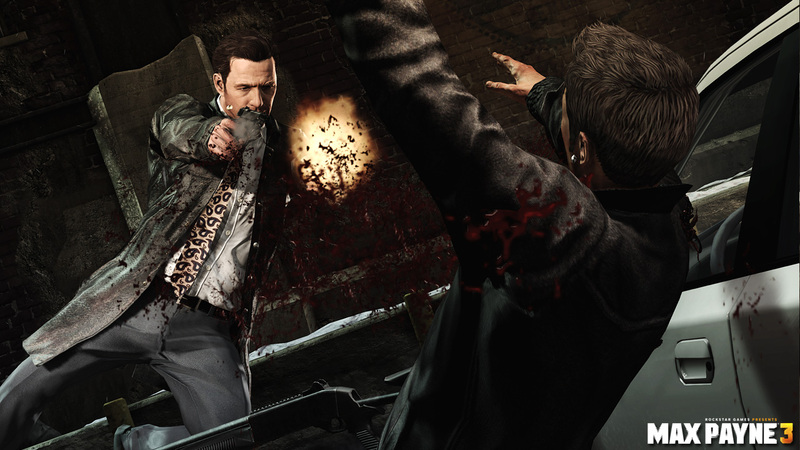 In terms of gameplay, Max Payne 3 hasn’t changed that much. Is that a bad thing? Some might think so, especially in the light of how the cover system in gaming has evolved since the series began. I personally think while it’s far from perfect, it still has a nice charm to it that still stands out. Bullet-time works just as well as it ever did and the Kill-cam moments are truly exceptional. You may be overwhelmed with the difficulty spikes, even on Easy. But luckily, painkillers are usually not too far away from Max, unless you are playing on other difficulties…in which case, they are rare. The campaign also has collectables in the form of “golden gun” attachments and evidence like photos and so on. There are also TV’s to watch with some crazy adverts and shows on, it’s well worth taking a break from shooting to watch these, even if the dialogue is all in Portuguese. It is a little annoying that most of the conversations are like this and aren’t translated apart from key words which flash up on screen like headlines from a comic strip, but the story seems to do this for anything that is deemed important in the dialogue. 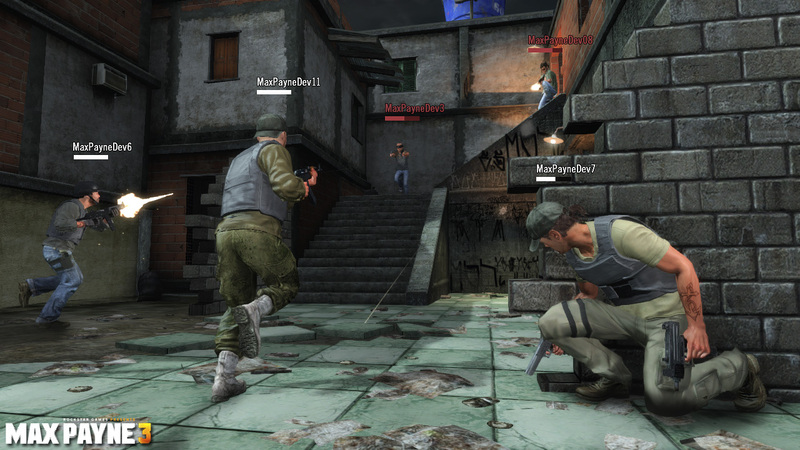 Surprisingly though, the focus from Max Payne 3 seems to be more on multiplayer than its single player counterpart. You can form private crews with friends, or join public crews. Players can be a member of up to five at the same time, and completing tasks as a crew will gain XP points for the player. There are some good ideas here and they are implemented well, in fact it feels smoother and more enjoyable than the campaign. Visually, Max Payne 3 looks damn good. Slow-mo bullet-time sequences still look amazing, while the character models also look impressive. Voice-acting is a bit of a mixed bag at times, but it’s decent for the most part and proof of why Rockstar is so good at presentation. The music is also pretty catchy; except for the music in the nightclubs which even Max can’t stand. Max Payne 3 may not reinvent the wheel of the third-person shooter, but it still does a decent job in presenting an experience unlike any other. So the mechanics may be a little dated at this point and slow-mo diving may result in your death instead of your survival, but it’s memorable and the multiplayer is also quite addictive. It’s nice to have Max back and hopefully it won’t take another 9 years to see him return.